Sardinia is the second largest island in the Mediterranean Sea. It has nearly 2,000km of coastline with sandy beaches and a mountainous interior with hiking trails. On my recent trip to Italy, on a Mediterranean cruise, we passed by Sardinia. From the cruise ship, it just looked like a big rock. I immediately did my own research and was mesmerized by the beautiful Sardinia beaches. I haven’t visited Sardinia yet, but it is very high on my list of places to explore. 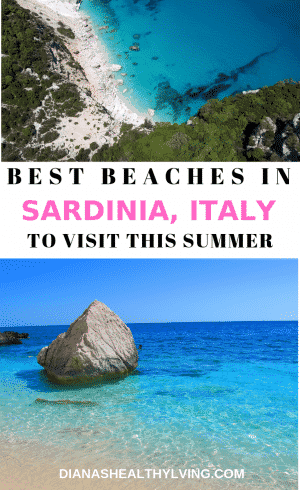 I collaborated with other travel writers for their top picks of the most beautiful Sardinia beaches. The island regularly top ranked for some of the world’s best beaches. With spiagge ranging from the rugged, cliff-backed coves of the east to the dune-flanked strands of the west. Sardinia’s snow-white beaches with crystal clear turquoise water are often compared to the beaches of the Caribbean. The Natural Pools of the Maddalena National Park are, in my opinion, amongst the most beautiful beaches in Sardinia and the world. The Natural Pools are a big area enclosed between the islands of Budelli, Spargi and Razzoli, where thanks to the cover provided by the islands the water is always calm. The water here is also crystal clear, which on sunny days creates that shimmering light effect as if you were looking into a pool. Due to the varied seabed floor (algae, sand, rocks etc) when you look down at the Natural Pools from above you will see patches of different shades of blue, as if they were lots of little pools, from where the plural name comes from. The only way to reach this area is by boat, from the nearby harbours of either Palau or Maddalena. In summer you can find boat tours for every budget, from the private sailing experience to a bigger party boat. There is only one beach in this area called “il Cavaliere” on the island of Budelli. It has soft white sand and the water close to shore is especially clear, but since it’s the only sand beach it gets very crowded. 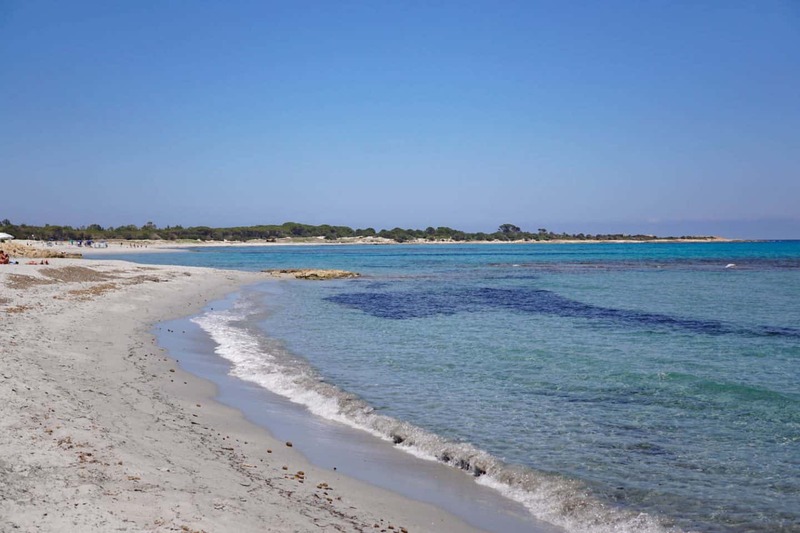 All along the coasts of Razzoli and Santa Maria are smaller lagoons and rocky beaches, where the sea is just as stunning. If you’re looking for a truly extraordinary beach destination, you must add these Natural Pools to your travel bucket list. It is said that the reason for its characteristic shape (that you can see in the picture) is because of the fall of the Devil to Earth, smashing his buttocks right on that hill… Poetto’s beach doesn’t have the white sand that you will see on other beaches in Sardinia, but the water will be blue, of course, and crystal clear. 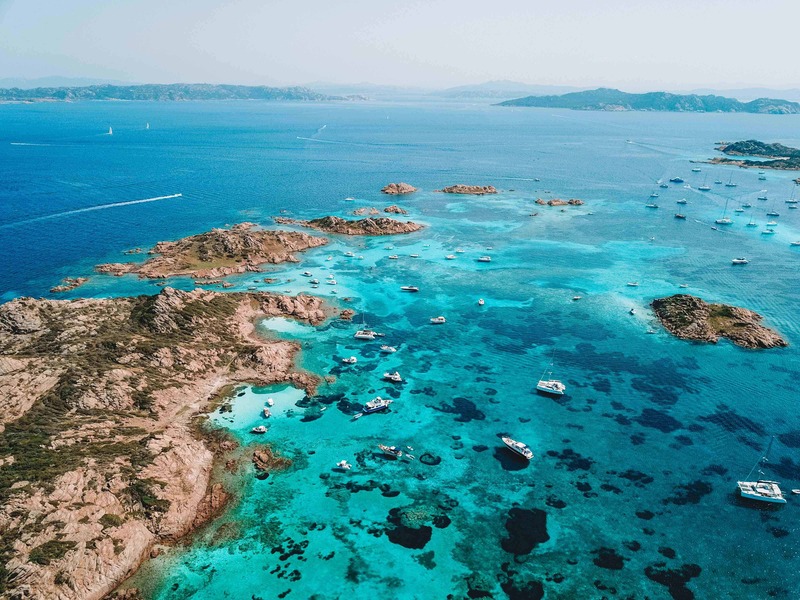 As it is connected with one of the main cities in Sardinia, there are cafes, live music, bars and restaurants, making it lively and worthy of visiting even during winters. Recently, the government of Cagliari created a boardwalk with several lanes, to allow citizens to bike, run, skate, and walk in perfect safety and harmony. Poetto’s beach is the joy and the pride of the locals, that have year-round enjoyment with exquisite access to a huge, long beach, and to one of the most popular sea waters in Europe. Cala Luna beach, one of the best beaches in Sardinia. It is located in the region of Nuoro in the center of the eastern coast of Sardinia. The cove which contains the small secluded beach is framed by rock faces that provide a popular rock climbing opportunity with a perfect view of the surrounding areas and water below. The beach is surrounded by rocks and hiking trails and is lined with natural caves that provide an escape from the sun and a place to relax. The highlight of the beach is the inviting crystal-clear waters that are ideal for snorkelling and swimming. The beach is accessible by foot or by boat. You can hire a boat out of the Cala Gonone marina to take you or it requires a 4-kilometre hike from Cala Fuili that some may consider strenuous. If you are feeling adventurous or like hiking you can hike to the beach and take a ferry and a taxi back to where you started at Cala Fulli. After a relaxing and refreshing time on the beach, you do not want to wear yourself out on the hike back. With a boat tour, you will also be able to visit the neighbouring Bue Marino Caves with captivating stalagmites and stalactites. Sardinia is a beautiful honeymoon destination. Sardinia is packed with gorgeous beaches. 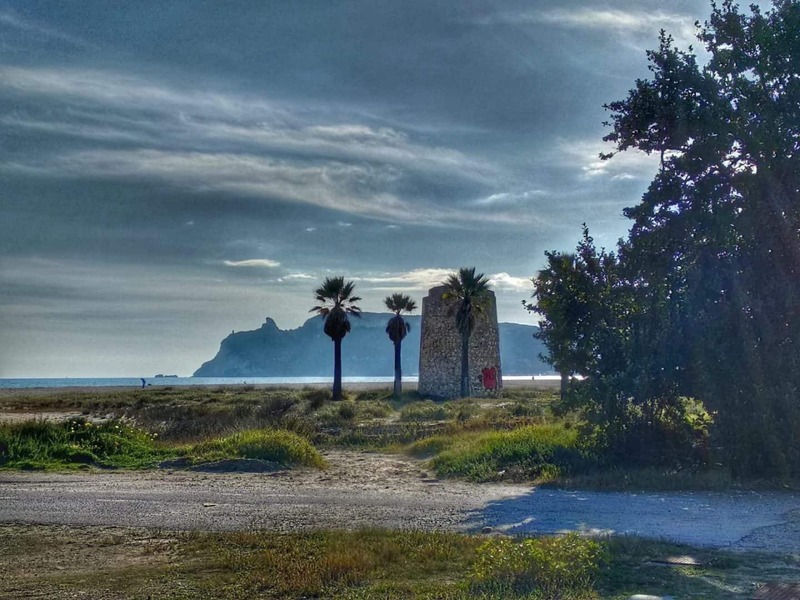 One of the nicest things to do in Cagliari in the summer is going on a day trip to one of the nearby beaches. Costa Rei is a locals’ favourite. The name actually refers to the coast, which is scattered with several incredible beaches. It takes anything between one hour to one and a half hours to reach from Cagliari, depending on traffic, but once there it is guaranteed fun. The main beach is in Monte Nai summer resort. It’s a long stretch of fine, golden sand with the clearest waters one could possibly want, and perfectly equipped with kiosks, parking lots, disabled access and rental of all sort of equipment. The most scenic point is the Scoglio di Peppino, a massive rock at the very southern end of the beach, in Santa Giusta. Mind you, on a busy summer day it gets very crowded – so aim to go very early for the best photo opportunity, then move to a stretch that is quieter. 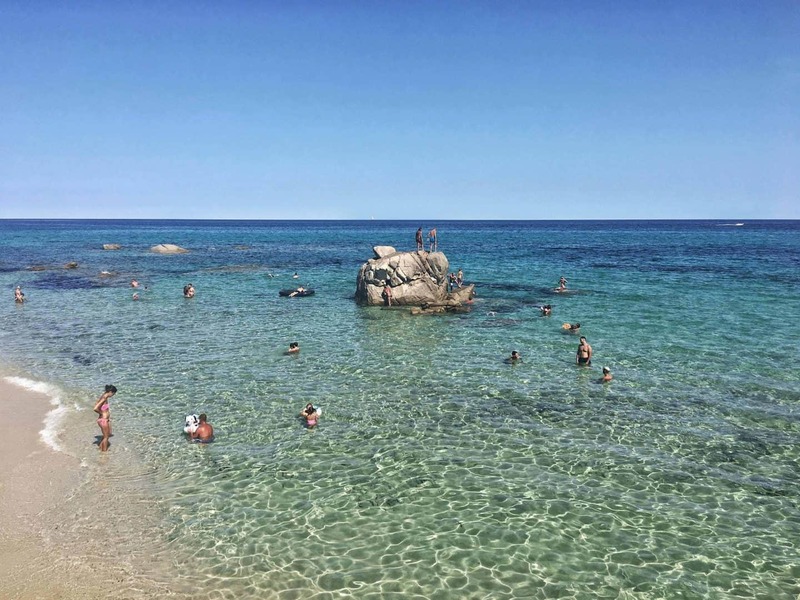 Other great beaches in the area are Monte Turnu, a smaller cove perfect when it is windy; Cala Sinzias and Cala Pira, which is surmounted by a Spanish watchtower, and Capo Ferrato, at the northern tip, which is perfect for snorkelling and significantly less crowded. Possibly one of Sardinia’s best-kept secrets, Cala Liberotto is a stunning white sand beach on the northeastern edge of the island. Located just up the coast from Cala Gonone, it often gets overlooked in favour of the more famous beaches in the area. But I’d suggest calling in on your tour of the island – especially if you’re visiting Sardinia with kids! Cala Liberotto is a very family friendly beach with its soft sand and shallow shoreline, plus there’s enough space for the kids to run around without bothering anyone in their wake. The beach isn’t overly built up, which means it still has a fairly rugged, rural feel to it, and there’s a lovely coastal walk you can take past rock pools and secluded inlets to lots of other beautiful beaches. Pack a picnic and set out for a day’s exploration! Nearby, you have all the facilities you’ll need in the petite village, including a small supermarket and a few casual restaurants to grab lunch or dinner. We rented an amazing Airbnb right on the beach at Cala Liberotto, but if you wanted something a smidge more affordable, Camping Sa Prama offers a range of comfortable accommodation options that are just a stone’s throw from the shore! I recently took a road trip in Sardinia and was completely blown away by the stunning beaches on the island. One beach, however, totally stood out for me and that was Cala Sinzias. It’s one of the most beautiful beaches I’ve ever seen (including beaches in the Maldives and French Polynesia!). A long stretch of soft white sand and crystal clear turquoise water. It feels wild and totally secluded, with a rocky mountain known as cappuccino rock at the southern end. There are Eucalyptus, olive and pine trees growing behind it. There is a beach club entrance, so you can enjoy a cocktail while relaxing or take part in a yoga class in the mornings. You can also rent SUPs, kayaks and inflatables boats and there is a diving centre for further exploration in the crystalline waters. 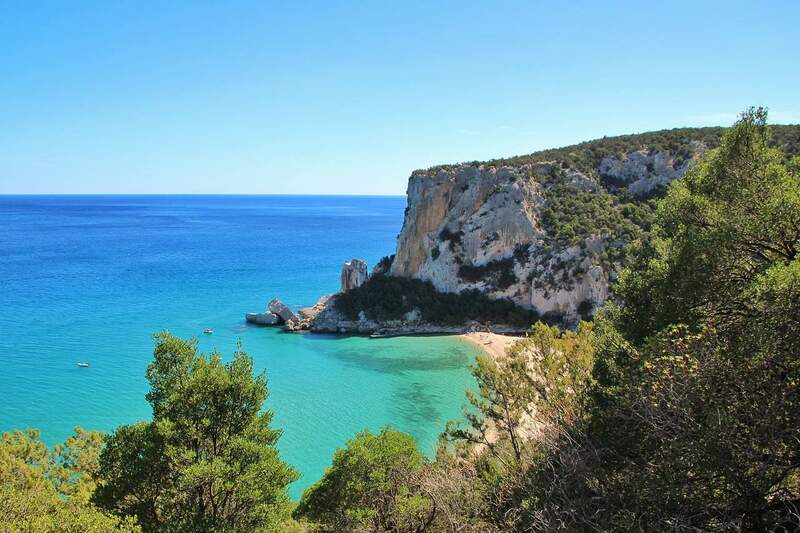 Cala Sinzias is really accessible; it’s a 50-minute drive from Sardinia’s capital Cagliari on the Costa Rei and has free parking with spaces for campers – so you can wake up right on the beach! 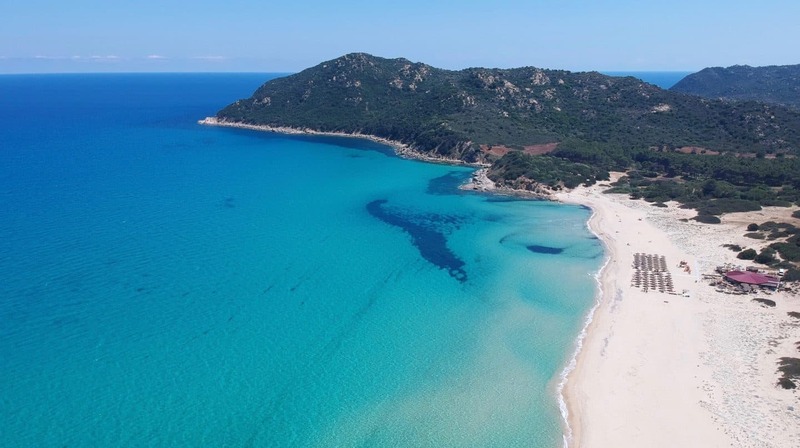 Known as one of the best beaches, not only in Sardinia but also all of Europe, Spiaggia La Pelosa, located on the north tip of the island, is a true paradise! Its shallow turquoise waters and 300 meters of white sand make it a perfect place for families visiting Sardinia. There is plenty of space to relax and play on the sand and the calm shallow waters mean that parents can relax a little. Spiaggia La Pelosa offers a beautiful view of Isola Piana and Isola Asinara. 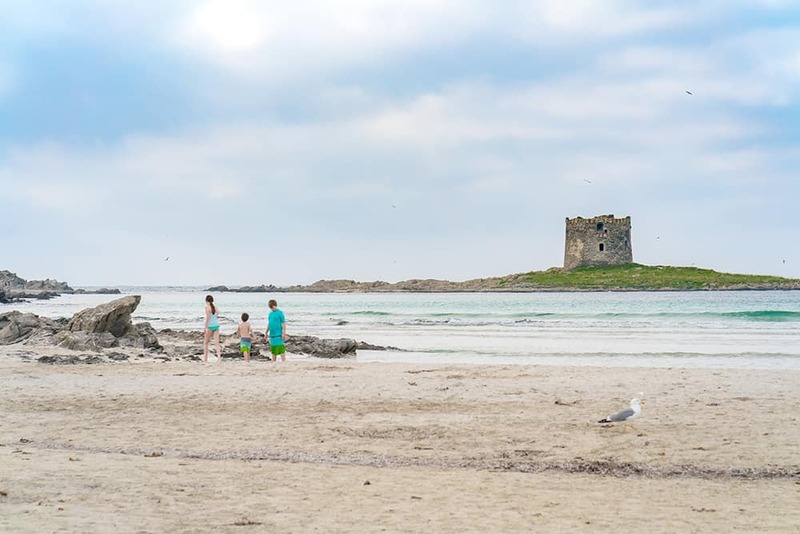 This might be one of the only beaches in the world that comes with its own little castle, which is actually an ancient sixteenth-century watchtower called Torre della Pelosa. It used to be part of Sardinia’s marine defence system, but now you can swim (or walk depending on the tide) out to explore it. Spiaggia La Pelosa has two diving centers that offer diving excursions. The crystal clear water makes for excellent visibility at the right time of year. You can also rent surfboards and kayaks. It truly is one of the best places to visit in Italy! 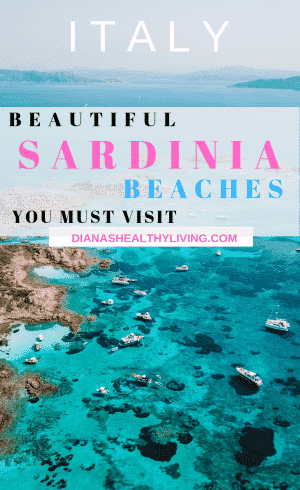 There are so many beautiful beaches in Sardinia and I certainly plan on visiting every single one of them. Have you been to Sardinia?